A 10-year study found that dolphin males show off to females by presenting them with gifts and flexing their bodies. 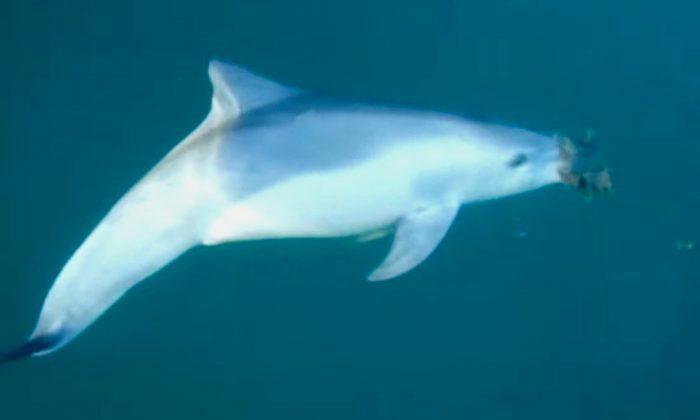 The study, published in Scientific Reports, uncovered sophisticated mating patterns rarely seen in mammals, and previously unknown in dolphins. The study took place along the western coast of Australia in sites that include Coral Bay, the North West Cape, Dampier Archipelago, Cygnet Bay, and Cone Bay. Male dolphins were observed presenting large marine sponges to females. Sometimes the male swam toward the female while pushing the sponge with his beak. Other times they toss the sponges toward the females overhead, above the water. “It’s gift giving, it’s a signal of his fitness (so) quality as a mate, or it’s a threat to coerce her into mating with him,” said Simon Allen, lead author of the study, via CNN. Another behavior seen were male dolphins flexing their bodies, with snout and tail pointed upward out of the water, in the presence of a female. Scientists of the study call it a “banana pose.” Sometimes the sponge presentation was followed by the banana pose. Males were also seen working together, helping each other to get the attention of a designated female. “The formation of alliances between adult males for the purposes of coercing females is uncommon since mating success cannot be shared,” said co-author Stephanie King. Only lions and some types of primates have been observed in such partnerships, according to CNN. According to Phys.org scientists from the University of Western Australia, the University of Zurich, and Murdoch University collaborated on the boat-based study. The next step in the study is to determine the effectiveness of this newfound courtship behavior. The next step will be to determine how often the rituals lead to mating, according to CNN. Please share this article with your friends and network.